This week’s interview was with Amanda Cleary, Health and Wellness Director of the Waltham YMCA. The Waltham YMCA serves many communities including Waltham, Lexington, Watertown, Belmont and Arlington. The YMCA promotes youth development, healthy living, and social responsibility. This branch features an outdoor pool that can be used during the summer months. We hope you enjoy reading more about the YMCA below! Why did the YMCA want to join in this initiative with Healthy Waltham to promote an age-friendly community? Why is healthy aging important to your organization? How do you see Waltham continuing to grow as an age-friendly city in the years to come? We wanted to get more involved with the Waltham community so that we could better identify needs and both specialize and supplement services. We hope to show people that we are a resource. Healthy aging is at the heart of the YMCA. We encourage physical activity, tight social networks, and emotional satisfaction. When people have strong physical, social, and emotional lives, they have better health outcomes. To grow as an age-friendly city, Waltham needs to continue to provide opportunities and outlets for seniors to get involved. These opportunities should be accessible and affordable to all seniors. What are the YMCA’s current goals, projects, and events, particularly in regards to healthy aging efforts in Waltham? We offer a variety of classes targeted for the senior population; some of these classes include: aqua, aerobic, and yoga. We have developed a diabetes prevention program in which we see individuals over the age of 65 have great success. We are also working to implement an enhanced fitness program which is already available at our Chinatown and Huntingon Ave. locations. This program is offered three times per week and focuses on arthritis, strength training, and cardio. We see steady participation within both the group exercise classes and personal training. What is the most unique project or event the YMCA is taking on in the Waltham Connections program? We have had the diabetes prevention program for a year and a half for all ages and are looking forward to implement the enhanced fitness program. Both programs can be offered off-site if people are unable to make it to the YMCA. The YMCA offers financial assistance for membership. We do not want cost to be a barrier for someone to get involved with us. We strive to take away the intimidation factor that can often come with working out. The Waltham YMCA is located at 725 Lexington Street Waltham, MA 02452 and can be reached at 781-894-5295. Check out our website here! 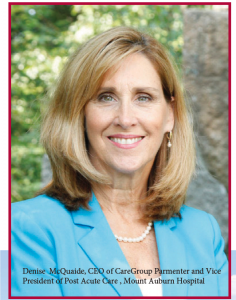 This week’s interview is with Denise McQuaide, the Vice President of Post-Acute Care at Mount Auburn Hospital in Cambridge and President of CareGroup Parmenter Home Care & Hospice. As a masters prepared geriatric nurse practitioner, she is responsible for strategic planning for transitions of care and developing models to support wellness initiatives outside the hospital. For over 100 years, CareGroup Parmenter has been providing in home healthcare to Waltham and the surrounding communities. A subsidiary of Mount Auburn Hospital, they provide Home Care, Palliative Care and Hospice care, keeping patients healthy at home. In 2004, Mount Auburn Hospital provided financial support and technical assistance to the new coalition called Healthy Waltham. Since then we have collaborated on many projects to promote healthy living. Mount Auburn Hospital and CareGroup Parmenter Home Care & Hospice, Inc. have been supporting the Waltham Community for decades. CareGroup Home Care was formed in 2000 as a merger of Mount Auburn Home Care and Waltham VNA. CareGroup Home Care merged with Parmenter VNA & Hospice in 2015 to form CareGroup Parmenter Home Care & Hospice, Inc. (CGP). Waltham is a special community for us, and close to 150 of the hospital’s employees reside here. As a hospital, a homecare and a hospice we are committed to keeping people healthy by supporting their personalized care in the community and throughout the health continuum. Our outstanding services are provided to Waltham residents at convenient clinic locations and in the patients’ own homes. People are living longer, and while nationally the life expectancy is 78 years, we see many people in Waltham living healthy lives well beyond. At the hospital, 80+ is our largest growing demographic. Our Geriatric Medicine service utilizes an individualized, family-centered approach to create a plan that fits each individual patient’s and family’s needs. We are excited to partner with Waltham as it takes these essential first steps-engaging key stakeholders and increasing communication about healthy aging- to creating an age-friendly city through Waltham Connections. What are your organization’s current goals, projects, or events, particularly in regards to healthy aging efforts in Waltham? We are very excited to continue to participate in the Waltham Connections project and strengthen Waltham’s in-home services network with better collaboration and integration. In addition to participating on the Steering Committee, we continue to work closely with Healthy Waltham and the Council on Aging (COA). Currently we have an active Stroke Awareness Campaign with the COA, participate in Health Fairs and our staff offer free monthly blood pressure clinics. Healthy Waltham’s Chef Reva is assisting Mount Auburn Hospital staff in a new Healthy Eating program that started in March of 2017. We are meeting in April with Neighbors Who Care (NWC). This will give the Mount Auburn Hospital staff a better understanding of the NWC services and vice versa. In 2016, Mount Auburn Hospital and CGP served more than 400 individuals in their Waltham homes. For many years, we have provided maternal and child health visits, VNA services, telehealth, hospice care and bereavement programs for Waltham residents of all ages. We are proud of our record of improving quality of life. We compassionately provide excellent patient-centered care for people when they are sick, disabled or struggling with mental or behavioral health problems. However, the future is where we are focused. The future is about strengthening ties with the community groups involved in Waltham Connections, especially Springwell, which is uniquely positioned to address other areas that affect the health of senior citizens such as housing, transportation, and long-term services and social supports. Working together, our goal is to keep the residents of Waltham healthy at home and not in the hospital. We remain committed and grateful for the opportunity to work with the Waltham Connections project, as well as Healthy Waltham, and to support residents of Waltham in their endeavor to be well. Not only is breakfast the most important meal of the day, but it can also be the most fun! In honor of National School Breakfast Week March 6-10, Chef Reva prepared “fun-fetti” breakfast parfaits using lowfat yogurt, granola, whole grain waffles, fresh fruit, and just a touch of whipped cream and sprinkles for a special treat. 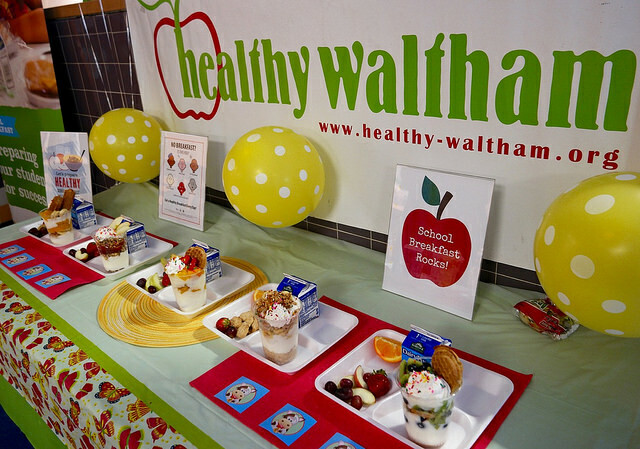 All six Waltham elementary schools got to try the new parfaits at lunchtime with Chef Reva. 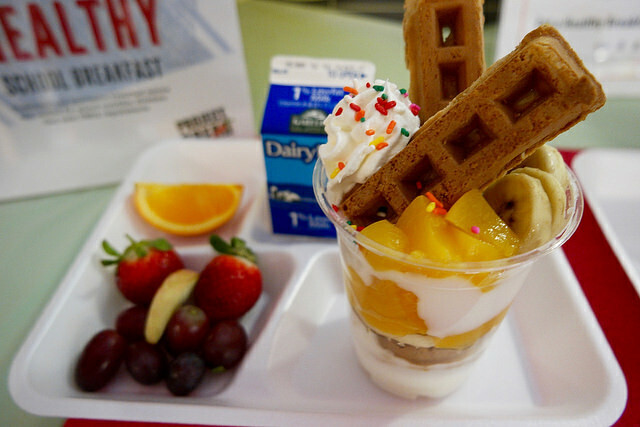 Friday breakfast parfait parties throughout the month of March further encouraged the kids to participate in school breakfasts. Our first breakfast program kicked off with a visit from Mayor Jeannette McCarthy, and officials from the USDA, Project Bread, Superintendent Drew Echelson, and Representative Tom Stanley. Our tasty and beautiful parfaits were well-received by students, administrators, and special guests alike. 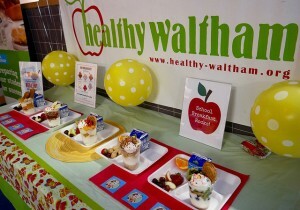 Fun-fetti breakfast parfaits are now part of the regular school breakfast rotation here in Waltham. You can read more about the festivities in the Waltham News Tribune article here. You can also see more photos here. A healthy breakfast complete with whole grains, protein from yogurt, and a variety of fruits! Want to make something similar at home? Fill small cups with low-fat plain or vanilla yogurt (make it Greek for extra protein) and top with cereal, granola, berries, bananas, nuts, graham or animal crackers, waffles or any other topping you’d like. Finish with a dollop of whipped cream and sprinkles (optional). For a dairy-free parfait, substitute cooked oatmeal or mashed banana for the yogurt. Enjoy!